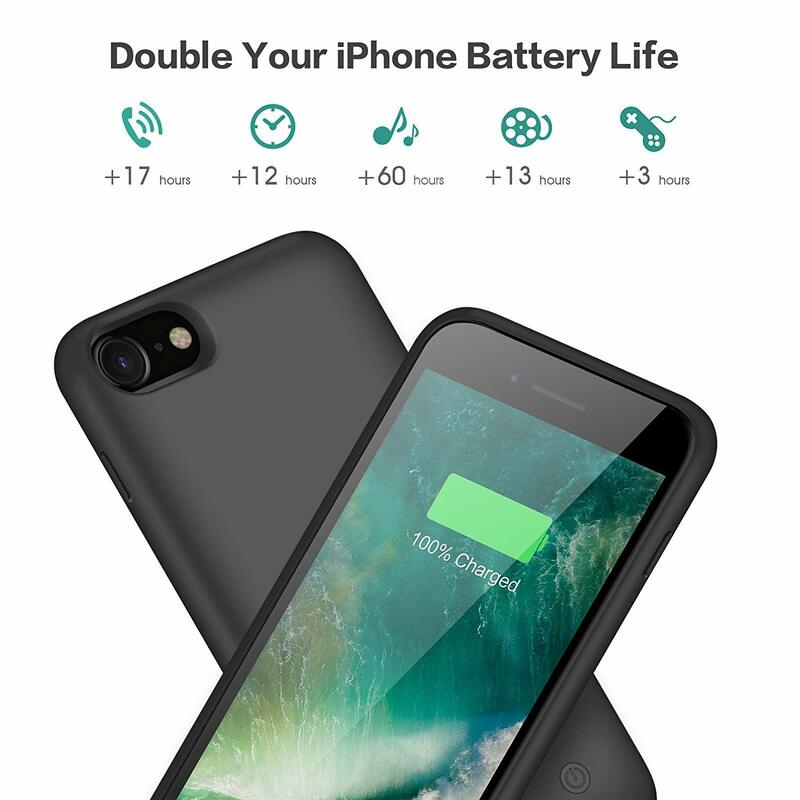 ★【Super Long Charging Time】★: This powerful 6000mAh Li-polymer rechargeable battery case can effectively provide 200%+ extra battery life for your iPhone 8/7, up to 17 hours talk time, 12 hours on web browsing time ,60 hours listen music ,13 hours video. 3 hours 3D gaming. 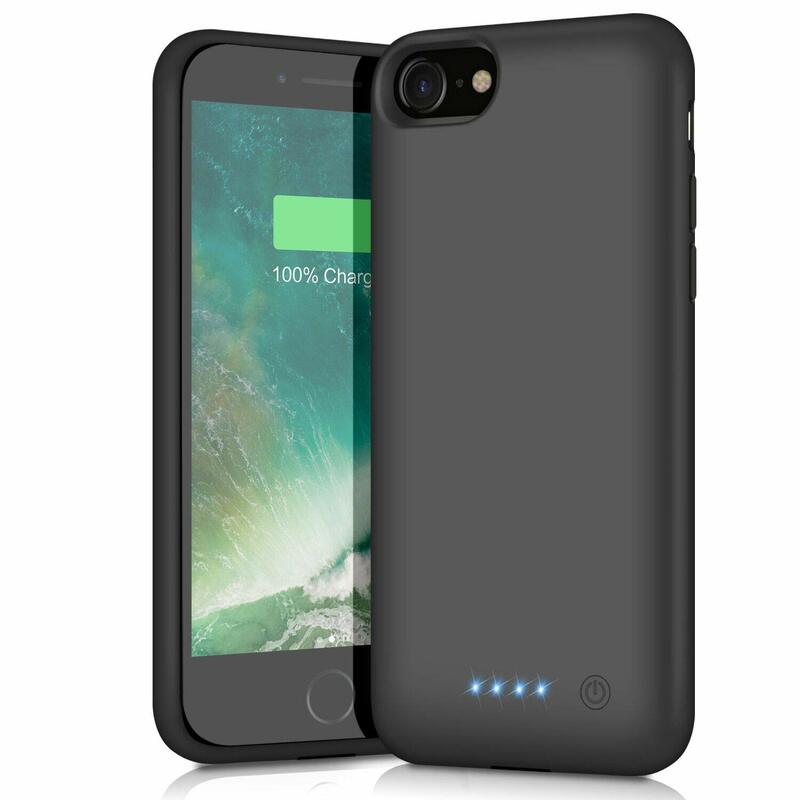 Which helps to keep your phone charged the entire day, do not need to worry the battery run out suddenly. 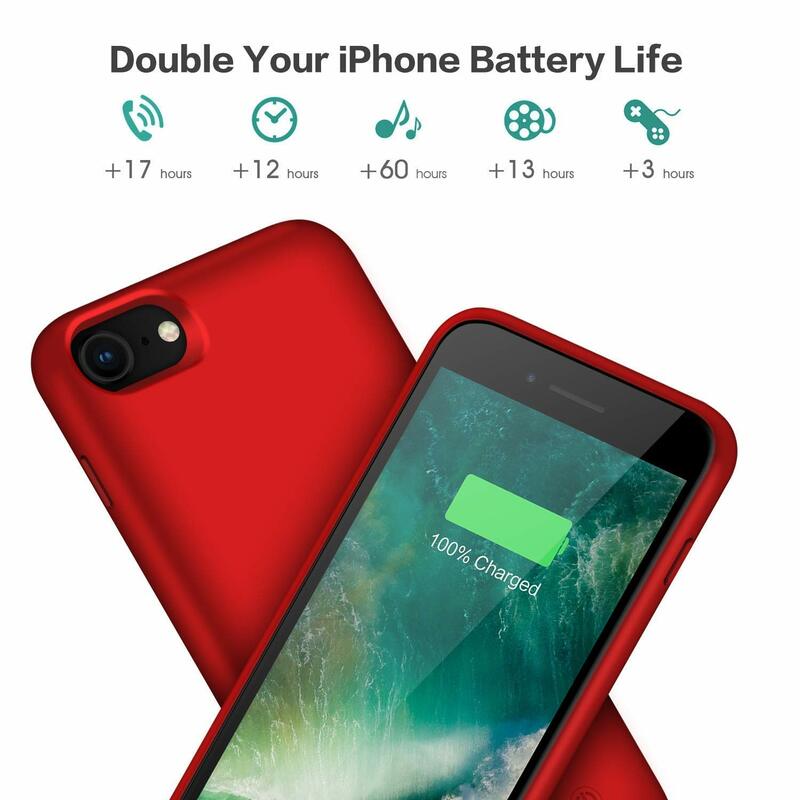 ★【Advanced Sync-through Technology】★: Simultaneously charge your phone and iPhone 8 / 7 battery case charger together, conveniently sync your iPhone to your Macbook, PC or laptop without having to take the battery case off. 100% compatible with all iOS versions, Apple Pay, and future iOS software updates (Apple Car Play is not supported ). 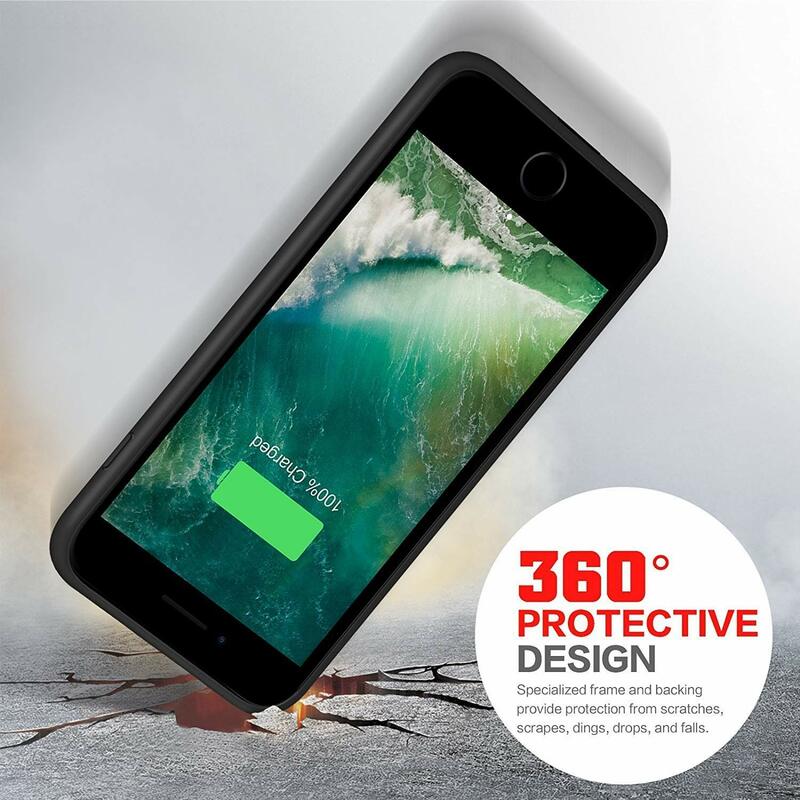 ★【Charging and Protection 2 in 1】★: The iPhone 8/7 charging case with 360° comprehensive bumper design and hard-shell back-plate, protecting your iPhone 8/7 from scratches and other daily wear and tear. The batteries use Grade A+ batteries with CE and RoHS certification. 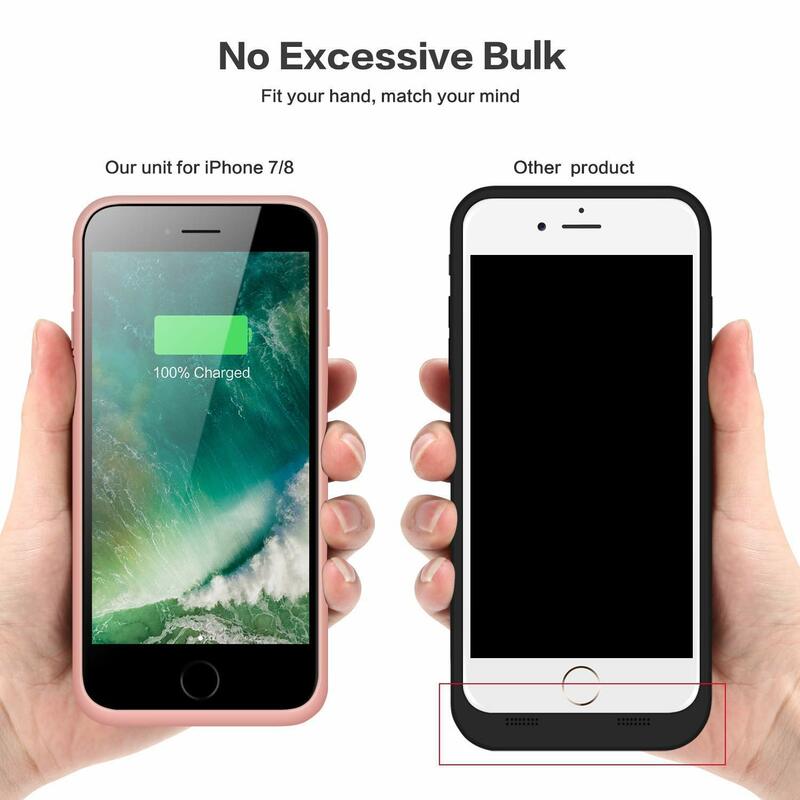 Internal high quality chips also protect your smart phone from overheating, short-circuiting and over charging. ★【Easy to Install and Use】★: 1. 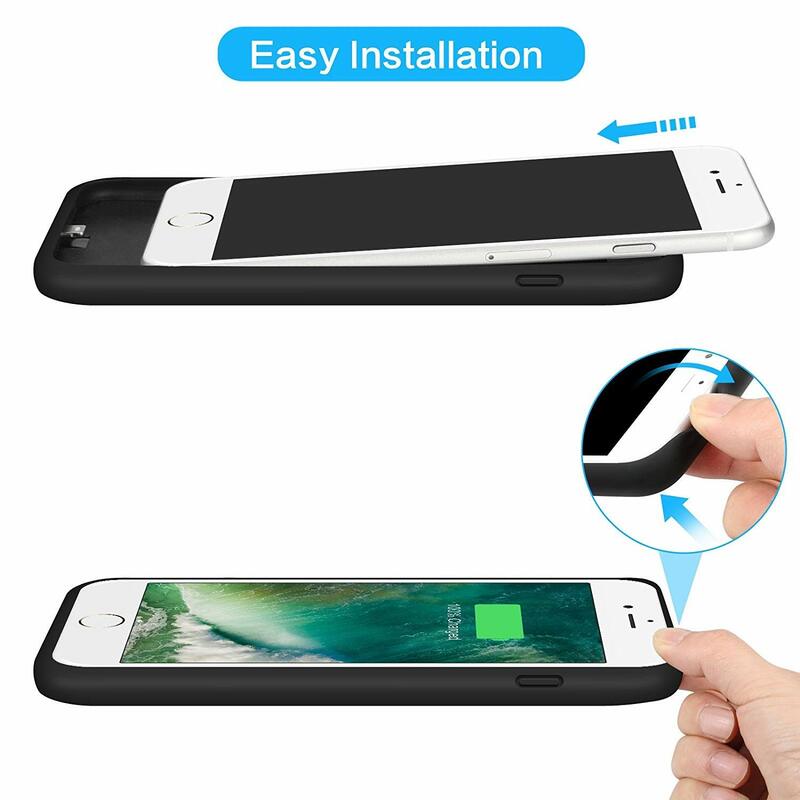 Push the phone along the top horizontally into the bottom of the battery case. 2. 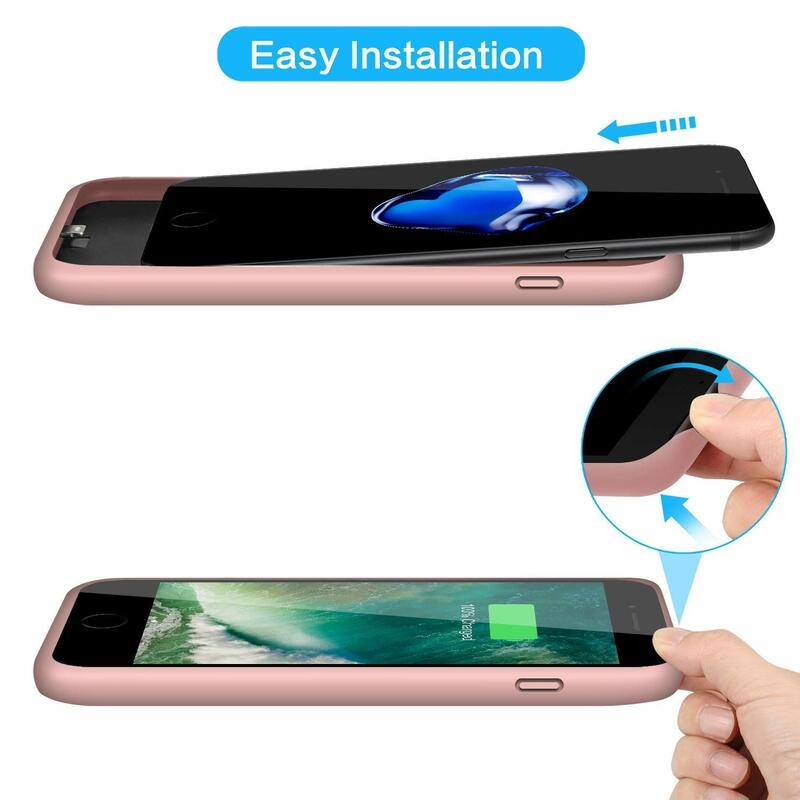 Connect phone charger interface to battery case completely, and press two side of phone lightly. 3. 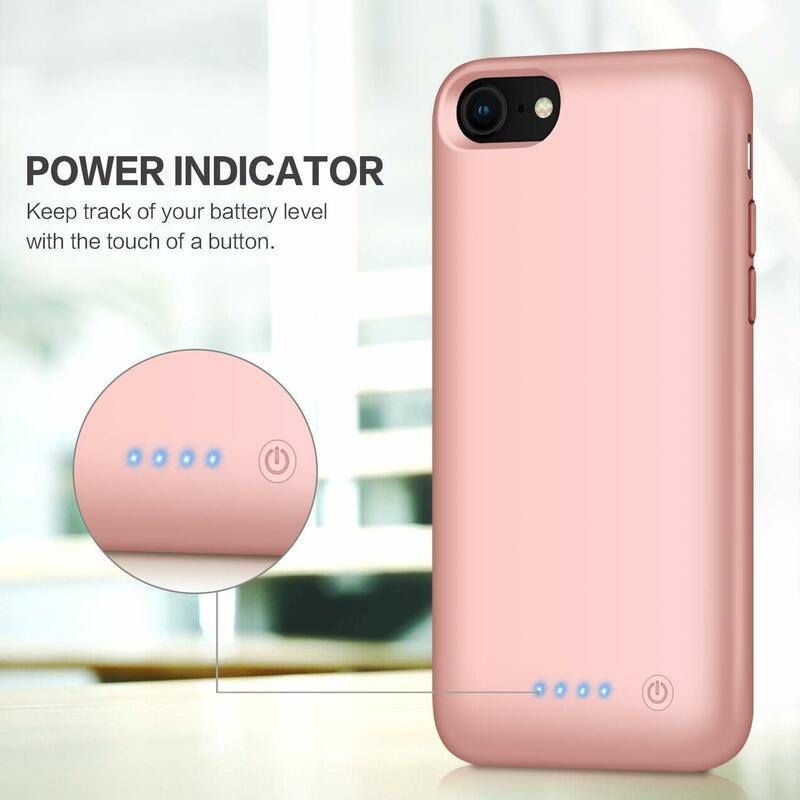 4 LED battery level indicators that let you know how much power you have (0--25%--50%--75%--100%); Besides, you can switch on/off the iPhone 8/7 charger case with the power switch button easily. 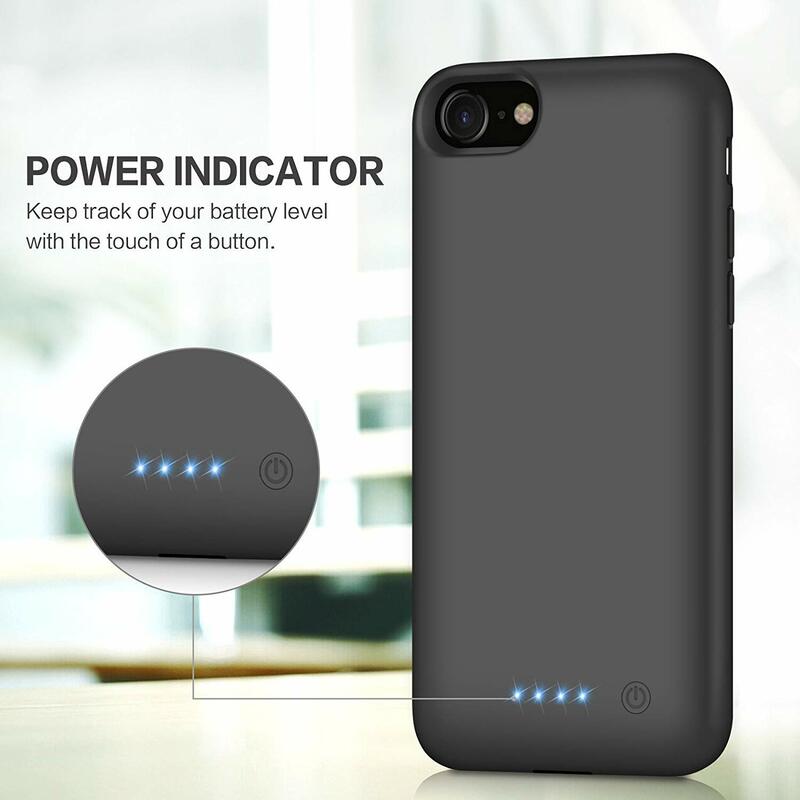 1.4 LED power indicators shows power status of external battery case(25%--50%--75%--100%). 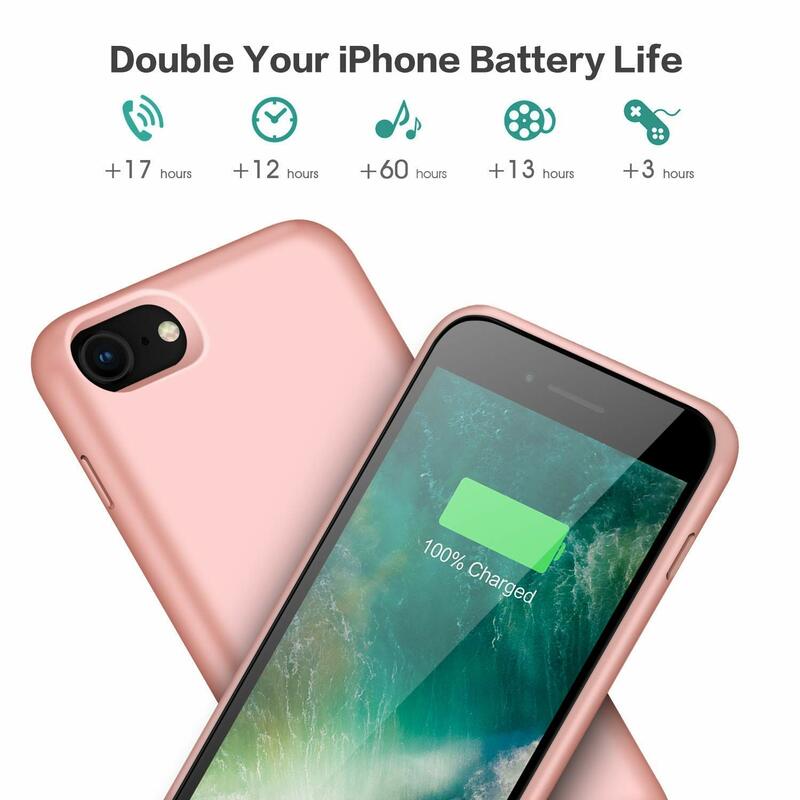 2.High quality extended built-in rechargeable battery, ON/OFF button for optional power output control, iPhone 8/7 battery use Grade A+ batteries with CE and RoHS certification. 3.100% compatible with all iOS versions, Apple Pay, and future iOS software updates(Apple CarPlay is not supported). 4.Full protection to corners and sides, protecting your iPhone from drops and impacts, not including phone screen. Connect phone charging cable (Not included) to battery case, and connect the other port of this cable to power adapter (like PC USB interface)to charging the battery case. When charging, the LED indicators are lighting. When full, the LED indicators will stop shining. 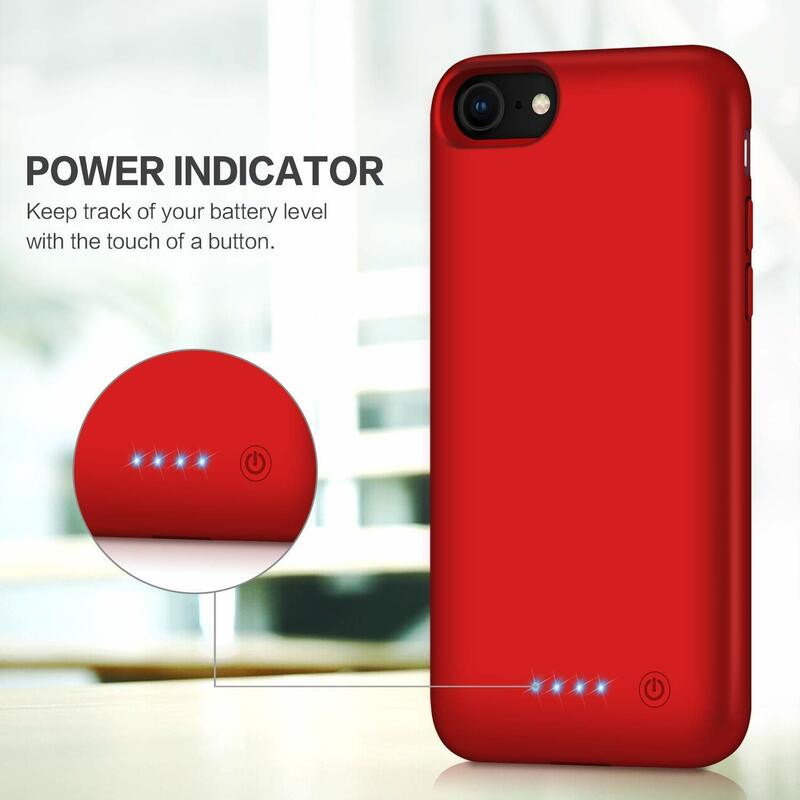 Put your phone into the battery case, press the button shortly to start charging, when charging, the LED indicators will tell situation of power, when phone battery are charged fully the LED indicator will close automatically after 5 seconds, and press the button, it will stop charging. 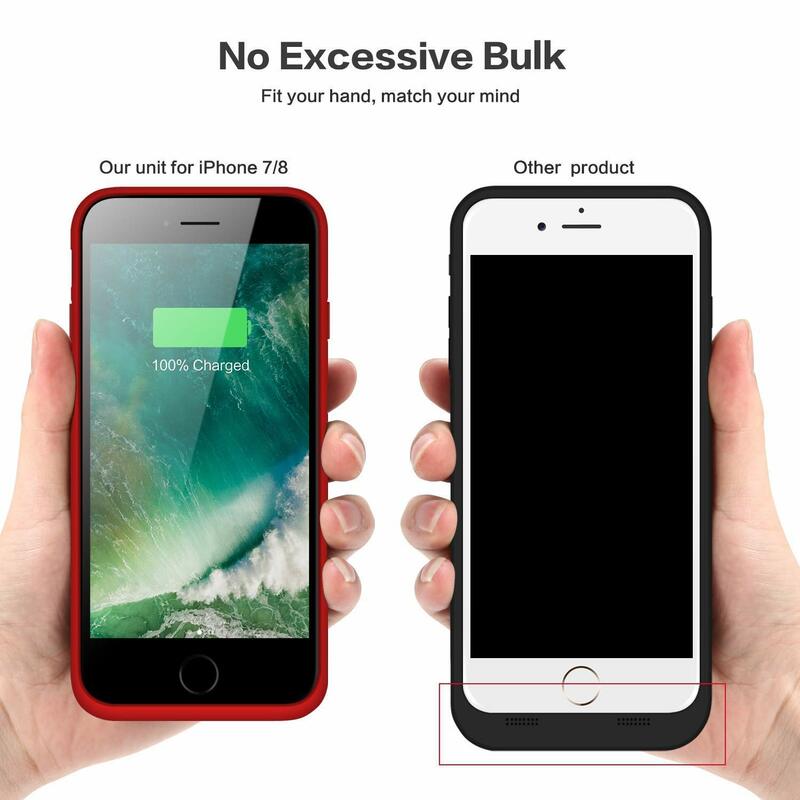 <1>This battery case is only fit for iPhone 8 & iPhone 7 (4.7 inch), Not fit for others. <2>Not compatible with iPhone lightning headphone or traditional 3.5mm headphones. ONLY works with Apple airpods or other wireless Bluetooth headphone. I have been wanting to buy one of these for a long time, but they were always so expensive. But this one is a bargain for its price. Doesn't charge quite as fast as my plug charger, but charges faster than portable batteries I've had. Recently my phone battery wasn’t lasting as long and carrying around a power bank isn’t always convenient. 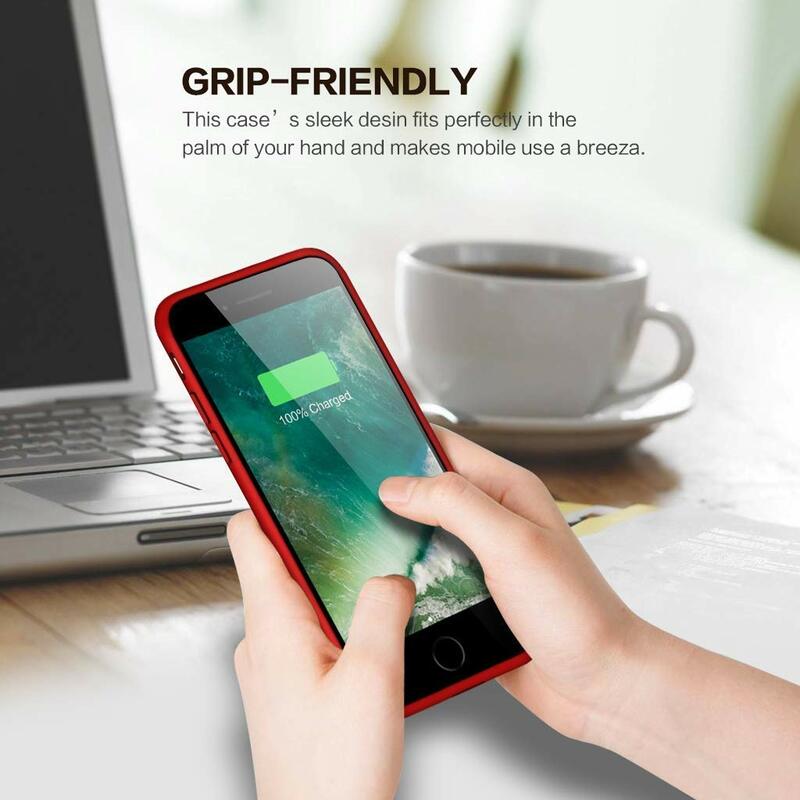 This case has been great! It can easily give my phone a full charge. I also love that I don’t have to remove my case to charge my phone or use the data synchronization. Another feature I like is that when I plug in my charger at night it charges both my phone and the case. 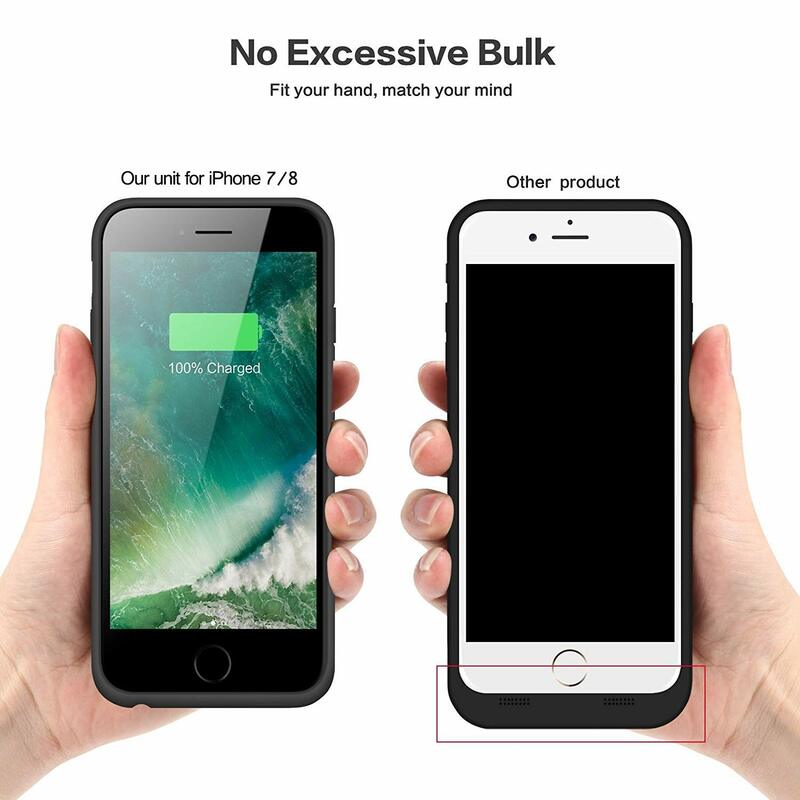 I honestly have yet to find a negative about this battery case. Highly recommend! I am going to be straight honest with this review and I am going to get straight to the point. 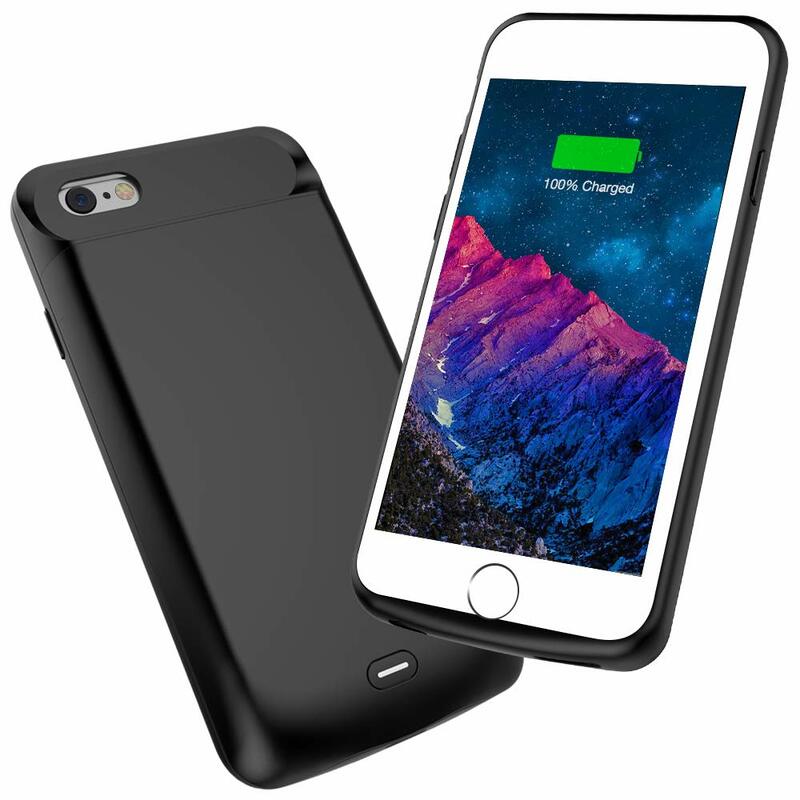 Overall this case is amazing, it extends my phone battery life by a whole lot. 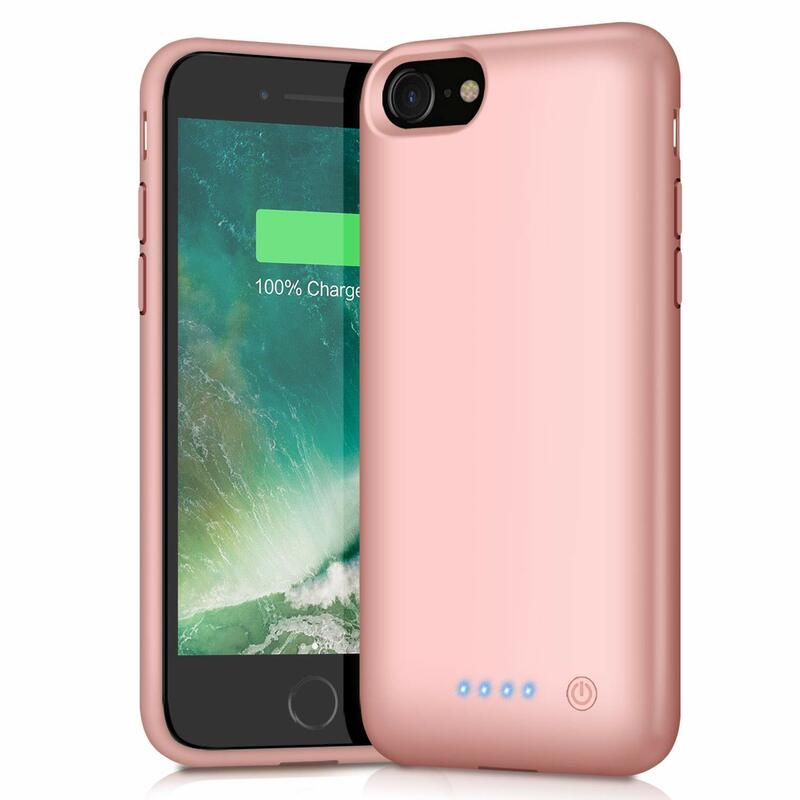 The build quality is superb and the pricing is excellent, 5/5 transaction, fast shipping. This case fits the phone snug as well, does not jiggle nor look like it might fall out. If you are considering buying this product, I definitely recommend this to you. 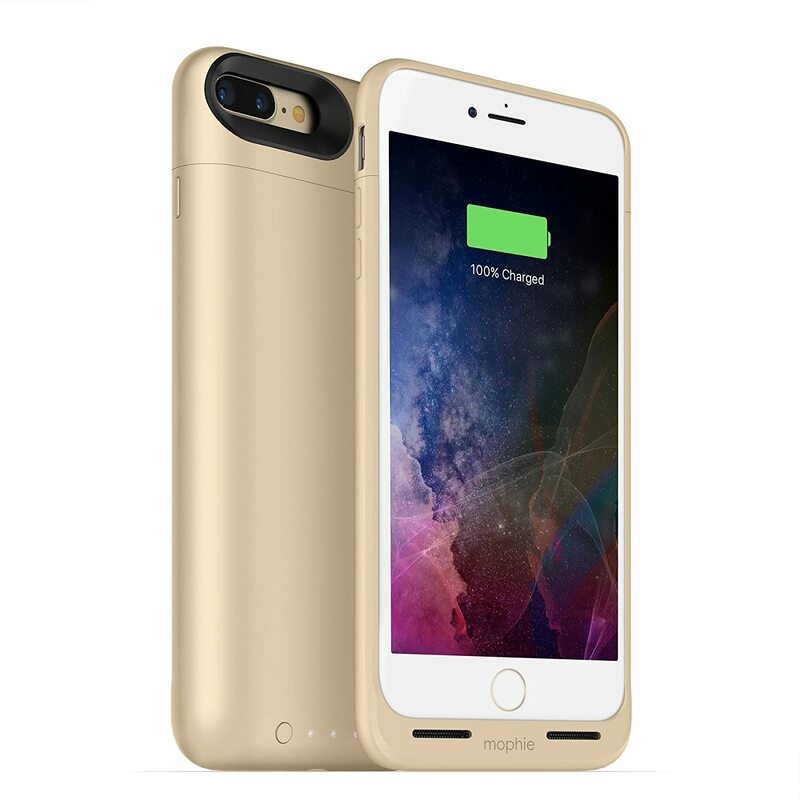 This purchase will satisfy your battery life needs. 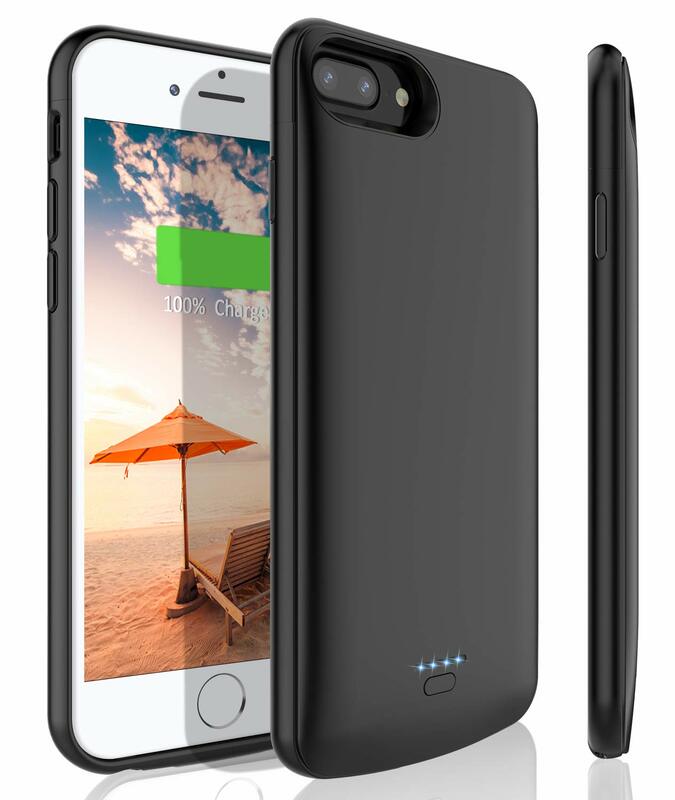 This iPhone 8 battery case recharges your phone multiple times, protects it from damage with its durable yet sleek structure, all while giving your phone a stylish appearance. 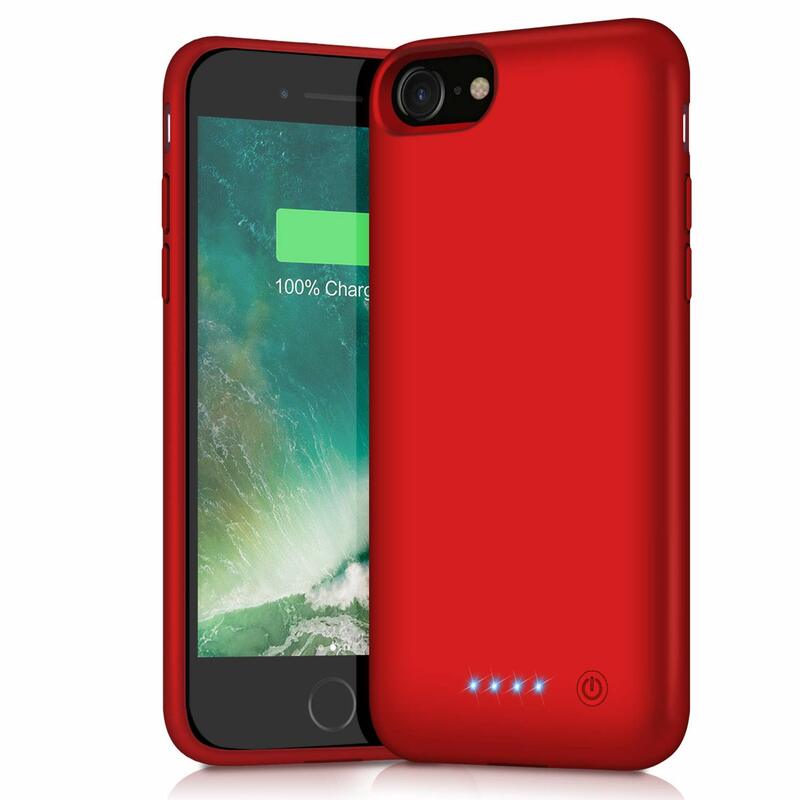 I loved the bold, iridescent red color, which is great because now that I basically have unlimited battery power, my phone is always visible in my hand while I'm out and about. 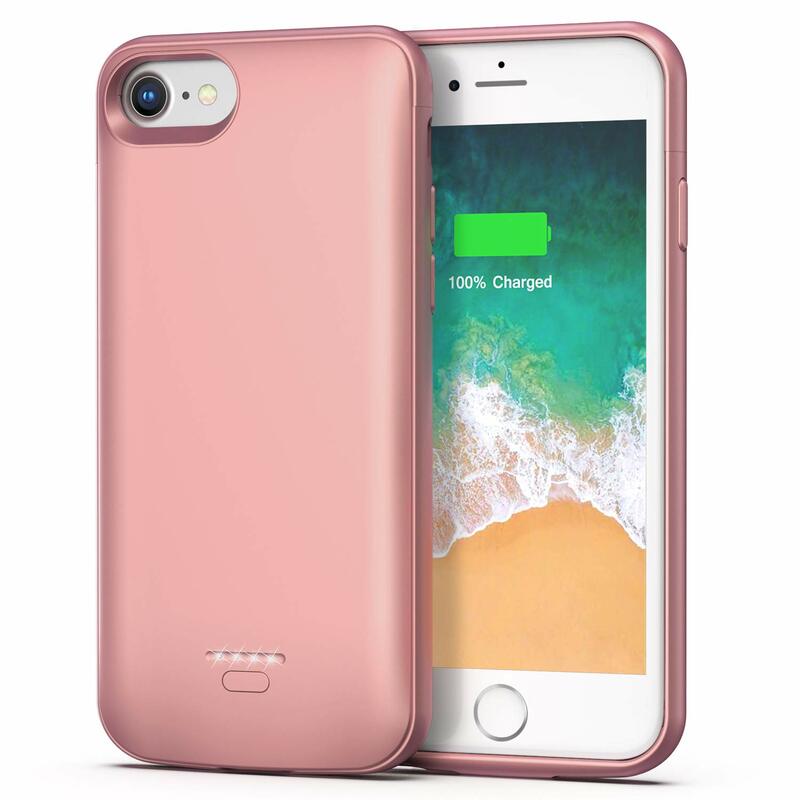 I definitely recommend this product to anyone needing an iPhone 8 case, regardless of if they prioritize style or function! It is very nice to just lay my phone on this charger in the evening. 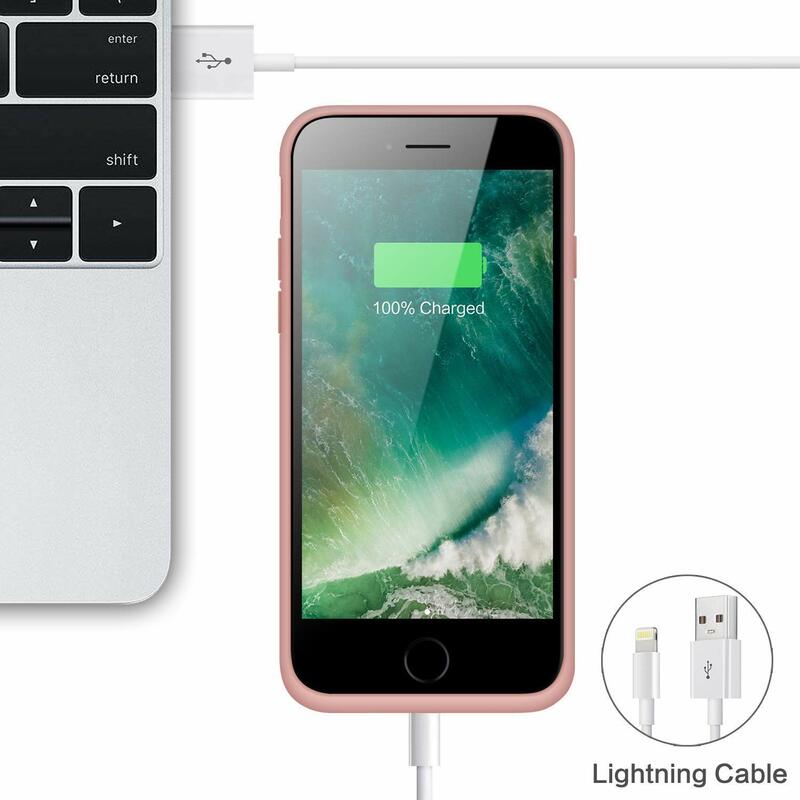 I did find out it charges better if I remove my iPhone from its case. Works like it's supposed to. I have a Samsung Note 9 and it charges it great. Zero complaints. Great product.